The European Neighbourhood Policy (ENP) is a recent example of an external EU policy drawn up explicitly with the objective of achieving coherence in the external policies of the EU and its Member States. Positioning the ENP in the legal-historical context of political union, this book explains why coherence has become a substantive issue in EU external relations, and why law is integral to attaining the ever-enigmatic single voice of the European Union. 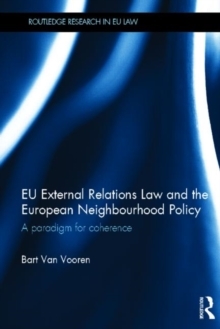 The text examines the role of EU external relations law in attaining a coherent neighbourhood policy and goes on to undertake an in depth analysis of the ENP, arguing that the innovative nature of the ENP in regard to coherence lies beyond the narrowly defined legal sphere, and stems primarily from its hybrid composition of hard legal, soft legal and non-legal policy instruments. Adopting an interdisciplinary approach by integrating elements of law, history and political science, EU External Relations Law and the European Neighbourhood Policy is unique in its approach to the subject. This book will be of particular interest to academics and students of EU Law, Political Science, History and International Relations as well as to practitioners engaged in the process of drafting coherent external policy.